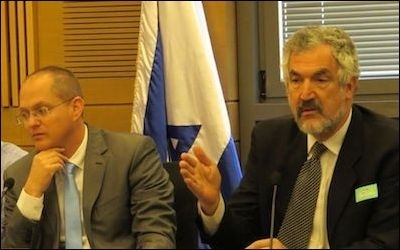 Israeli MK Oded Forer (left) with Middle East Forum President Daniel Pipes at the July 2017 launch of the Knesset Israel Victory Caucus (KIVC), which Forer co-chairs. A right-wing project working to shift the paradigm to end the Israeli-Palestinian conflict by declaring Israeli victory will make a new push next week to garner public support in the US. Daniel Pipes, founder and president of the Philadelphia-based Middle East Forum, who formulated the Israel Victory Project, is set to address students and members of the public at Columbia University's Chabad center on Monday night alongside two MKs who support the initiative. The project seeks to change the narrative in Washington around the Israeli-Palestinian peace process, by promoting a policy that declares "Israeli victory" and "Palestinian defeat." "The proposed policy calls for an end to the continuously futile 'peace process' that has led countless world leaders to believe that peace could be achieved by compromise and mediations," the project says. "The Israel Victory Project introduces a new policy for a peaceful solution: The Palestinians 'lose' by giving up their century-long rejection of the Jewish state, and Israel 'wins' by truly succeeding in its 150- year quest for a sovereign homeland." The group believes that the only way to end a conflict is by declaring a winner and a loser. The IVP approach is a drastic departure from the mainstream paradigm for achieving peace. This approach is a drastic departure from the mainstream paradigm for achieving peace, and the group has its work cut out for it to convince the international community to get on board. Nonetheless, it has started its process with Israel and the US. Earlier this year, a caucus was set up in the Knesset and in US Congress by the Middle East Forum. Rep. Ron DeSantis (R-Florida) and Rep. Bill Johnson (R-Ohio) are co-chairmen of the Congressional Israel Victory Caucus, while MK Oded Forer of Yisrael Beytenu and MK Yaakov Perry of Yesh Atid are co-chairmen of the Israeli branch. Forer, along with MK Avraham Neguise of the Likud who is also a member of the caucus, will join Pipes at Monday's event, addressing the view from Israel with regards to the Israel Victory Project's vision. "The Middle East Forum and the Israel Victory Project are not proposing a resolution to the conflict," director of the project E.J. Kimball told The Jerusalem Post on Wednesday. "We're not trying to propose a one-state or two-state or three-state solution, but to create and engage in a dialogue to create a new paradigm that moves away from the Oslo Accords into a policy that focuses on Palestinian rejectionism of Israel as a Jewish state as the main impediment to ending the conflict." MEF Director Gregg Roman, IVP Director E.J. 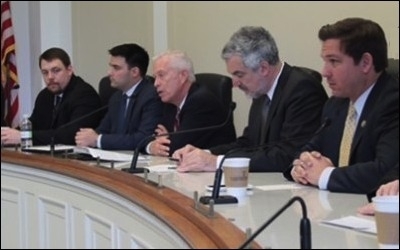 Kimball, Rep. Bill Johnson (R-OH), MEF President Daniel Pipes, and Rep. Ron DeSantis (R-FL) at the launch of the Congressional Israel Victory Caucus (CIVC) in April. The Forum, he said, is working toward a situation in which the conflict can be resolved, while the US and Israeli caucuses seek to encourage dialogue around that idea and may in the future formulate policies in accordance with that vision. The lawmakers will hold meetings in New York City and Washington where they will meet with their counterparts in the congressional caucus, as well as with Christian leaders, heads of pro-Israel groups, and Republican and Democratic members of Congress. On Wednesday, the two MKs will be joined by DeSantis and Johnson to talk about the initiative at an event on Capitol Hill, during which they will issue a joint declaration on the subject. They say it's the first time that a congressional and Knesset caucuses are working together on a vision to resolve the conflict. "Almost three decades of 'peace process' have failed to end the conflict between Israel and the Palestinians," reads a post by the Middle East Forum about the event. "Clearly, an alternative approach is needed, one which does not seek to placate the Palestinians but demands they stop their war on Israel. This approach holds that Palestinians must recognize that their century-long rejection of Israel as the Jewish state has failed. Once they do, they, as well as [the] Israelis, will benefit." The MKs are expected to discuss their work in the Knesset to advance a national movement to support the initiative, while their US counterparts will talk about their efforts to advance the agenda on Capitol Hill and their "campaign against wasteful spending on the failed peace process." The idea of Palestinian surrender, popular almost exclusively among the Right, has drawn its share of critics, usually from the Left. When the Congressional Israel Victory Caucus kicked off in April, Alan Elsner, a special adviser to the president of J Street, the self-described leftwing pro-Israel lobby, called the idea "savage and dangerous." Elsner asserted that "more Israeli repression will provoke more Palestinian resistance – both nonviolent and, unfortunately, violent – leading to more untold tragedy and suffering for both nations." In a January article for the leftwing website +972 Magazine addressing the general idea of forcing a Palestinian surrender, Nathan Hersh and Abe Silberstein asked, "[I]f 50 years of occupation, 40 years of settlement expansion, two major wars in Gaza, and the suppression of at least two popular uprisings have not 'defeated' the Palestinians, what exactly will?"